The second release of luxury homes at the Vision by Halcyon waterfront Over-50s community at Hope Island has been released to market following strong post-launch sales. With only two remaining homes for sale from its initial release, developer Halcyon has announced a further 20 residences at Vision - its first community to offer absolute waterfront living. Homes are within 150 metres of the waterfront and earned eight-star energy ratings. This release comes during construction on the 88-home community’s first residences, with some expected to be completed by Christmas. Peter and Elaine Hulme will be among the first home owners to move into their new Vision by Halcyon home which will undergo construction this month. The couple, who are moving from nearby Halcyon Waters, have purchased a waterfront house with two-bedrooms, two-bathrooms and a large open outdoor living space. Halcyon Joint Managing Director, Bevan Geissmann, said recent buyers had been a fairly even mix of locals and those from Brisbane, Northern NSW and interstate. 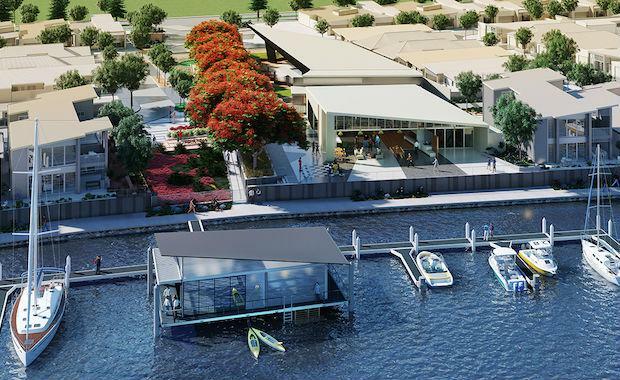 Dr Geissmann said the second release of homes coincided with construction work starting on Vision’s Lifestyle and Aquatic Precinct, which will include a leisure club with fitness centre, a floating boat house and a function space. The Lifestyle and Aquatic Precinct will offer a wide range of health and well being facilities. “The market’s reaction to the project has been terrific; it has prompted us to bring forward the second release and crank up our building program,” he said. Vision by Halcyon Project Director Scott Ng said construction on the homes had started following the completion of civil works in the first release. Mr Ng said ground works on the balance of the project site would be completed this month, adding that the traditionally dry winter months were ideal conditions for construction. “At the current rate of progress, we will have our first display home complete and ready for viewing in October,” he said. Construction of the community’s 52-berth marina is scheduled to start soon. The second release homes are priced from $551,000, including up to $20,000 in off-the-plan incentives, and rise to $1.23 million for expansive waterfront dwellings.